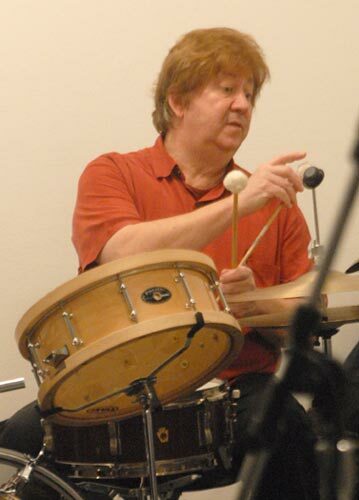 Carl Ravendrummer, bass guitarist, and accordionisthas worked with a variety of mostly Milwaukee based bands as a performer, arranger, and composer for over fifty years. Carl played bass guitar with the Robbs, with whom he had several national record releases on Mercury and Atlantic Records, one of which was a recording with renowned guitarist James Burton, who had served as lead guitarist during Elvis Presley's final ten years. Since the early 90's, Carl has focused on percussion study and performance in jazz and its related African and African-Hispanic heritage. He has attended workshops with internationally acclaimed drummers Max Roach and Joe Morello. Carl has performed as a freelance drummer in the Milwaukee area with various local straight-ahead jazz groups led by John Hefter, Rick Santiago, and the late Kenny Danish. Carl is leader of his own mainstream group, The Carl Raven Jazz Collective. In 2004, Carl joined with saxophonist and clarinetist Frank Marquardt to form Collective Neurosis, a freeform jazz-based improvisational band, which later grew into its present quartet status with trumpeter Rob Schoenecker and cellist Henry Steinfort. While Collective Neurosis is still searching for its first major CD album release, the group has enjoyed the distinction of having had its original pieces, in the upper-forties in number, played on WMSE FM, airing on "Dr. Sushi's Free Jazz Barbecue" show. Carl also performs as drummer with Once Now Ensemble, a group playing spontaneously improvised music.